There have been few cooking tools throughout history that have the staying power of Dutch Ovens. We all know how versatile and timeless that this type of cookware is. You can make almost any recipe your heart desires. So, What is a Dutch Oven you might ask? Well, continue reading to find out. Whether it’s to braise meats, roast vegetables, bake a pizza or create that amazing family casserole everyone is raving about. If you are interested you can view our article on the Top 6 Dutch Oven Uses for more information. There is no question a high-quality Dutch oven, preferably a cast iron one will be a welcome addition to any kitchen. So, What is a Dutch Oven? I thought it would be fun and educational to take a brief look at the history of the much beloved dutch oven. So let’s begin. Commonly referred to the “Cooking Cauldron” or “Black Pot” in the early days of written text and even in the Bible. These so-called “black pots” were usually made from cast iron but later were made from cast aluminum and even ceramic and was placed on top of open fire pits. These early black pots could be found throughout history and the world in many sizes and thicknesses. Everywhere from China and Japan to the Balkans and South Africa you would these little wonders of engineering keeping people fed and nourished. As time progressed more and more design changes were implemented and in the late 1600’s the Dutch had a much more advanced technique for manufacturing Dutch ovens, which they called “Braadpans,” than the English were creating at the time. The Dutch often used dry sand in their mold process which gave their Dutch ovens a much smoother surface. As the Dutch imported these higher quality Dutch ovens into Britain many people took notice. One Englishmen who took a liking to these new pots was named Abraham Darby. In 1704, He took a trip to the Netherlands and studied their system of dry sand molding and was very impressed. Back in England in 1708, Darby patented a casting procedure that was very similar to the casting method he had observed in the Netherlands and began to produce cast metal cooking pots for Britain and as well as for the American colonies. Even though in most non-American English speaking countries they refer to the “Braadpan” as simply a ” Casserole Dish” the term “Dutch Oven” caught on because of the original Dutch process of dry sand molding metals and the term is still used in America today some 300 years later. In America, the Dutch oven was well received but was also a little familiar to most of the colonists. They had used some sort of metal cookware at one point or another. It was used in villages, towns, and even Thanksgiving celebrations. Even Native Indians eventually used dutch ovens when trading began between the colonists. Lewis and Clark were also fans of the Dutch oven. They would always carry a set with them in all of their Western-bound adventures. As the years progressed, modern day manufacturing techniques and materials would try and replace cast iron as the dominant material. While the modern-day Dutch ovens have their place, it’s hard to beat a high-quality piece of cast iron. Cast iron is usually pre-seasoned from the factory and is very rugged as well as having a high heat tolerance. On top of that, if you take care of your cast iron dutch oven it will last for generations. Our top pick for Dutch oven is actually ane enameled cast iron Dutch oven. 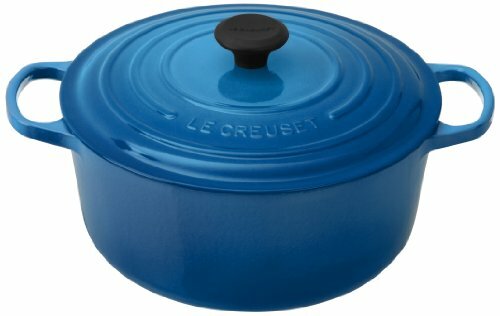 The Le Creuset Signature Enameled 7-1/4-Quart Dutch Oven brings quality, durability, and style. And while this product is on the pricey side, we truly believe it is well worth the money. Furthermore, this Dutch oven is proudly made in France, so you know that quality is of the utmost importance. And with a capacity of over 7-Quarts, this Dutch oven is sure to feed the hungriest of families. With that said, if you are interested in this product, it can be found at Amazon.com today. While not a comprehensive history of Dutch ovens, we hope it was a useful tool in your future search. For our top choice of a great Dutch oven that is perfect for camping, go to our review of the Lodge L8DD3 Cast Iron Double Dutch Oven. With a wide range of recipes and ease of cleaning, a cast iron dutch oven really is the best choice. I would like to thank you for taking time out of your hectic life to read this article. I hope you have a wonderful life and please take care. Calphalon 5-qt. Stainless Steel Dutch Oven vs Calphalon Unison 5-Quart Nonstick Dutch Oven with Cover – What’s The Difference?